Planar Systems, Inc. has released the Planar DirectLight LED Video Wall Calculator, a free online tool that simplifies the video wall selection process by helping customers visualize and plan for their LED video wall installations before they make their purchase. The Planar Video Wall Calculator interface in action. The Planar DirectLight LED Video Wall Calculator allows customers considering the Planar DirectLight LED Video Wall System to preview implementations of the solution in a variety of indoor environments including public venues. By allowing customers to visualize their designs complete with custom content and technical specification data in advance of their purchase, the Planar DirectLight Calculator takes the guess work out of video wall planning. Built for Planar DirectLight LED Video Walls, the Planar DirectLight LED Video Wall Calculator offers a user interface with advanced room customization features. 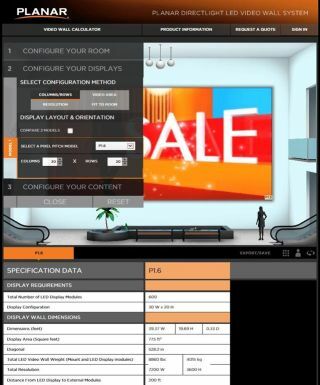 The online tool allows customers to design video walls with ease, speed and accuracy. Using the Planar DirectLight Calculator, customers can compare different display models and configurations side-by-side in the same environment, allowing them to determine what designs might look best in their environment. They can upload and preview their own video wall content as well as obtain detailed project renderings and specifications requirements that can be shared with colleagues and prospective customers. They can also submit automatic requests for price quotations to Planar. “The new Planar DirectLight LED Video Wall Calculator helps us to quickly compare video walls and make recommendations to clients, saving us hours in design and analysis,” said Alan Jackson, sales engineer for Pro Sound & Video. Using the Planar DirectLight Calculator, users can define the size of their room, choose one of several room environments and select their wall color. Customers can choose a specific model and enter their desired display configuration, choosing from a variety of popular configurations like Full HD and 4K resolutions, or defining any other configuration. They can then save the rendering for inclusion in a project proposal. Customers can upload their own image or video or select from a pre-set list of content options to preview what the video wall will look like.